Reviews of Sets. Unless Trick wants anything in particular, I think I’ll keep them over here. Yes, Derfington did a great job last time but I’ll work time into my busy schedule to work it in (hopefully). Did you know Derfington’s writing about Commander on QuietSpeculation? (articles here) Yep, we be spreading out. Talking about upcoming Commanders. Yes, Glissa 2.0 has been revealed and I’ll get to that shortly (before Mirrodin Besiged gets released). Again, not as long, but that will be the focus. Random things. I want to do some charts on this site, such as what you can tutor up with Trinket Mage, etc. All in due time. And now, introducing today’s column, once a week. Ladies and Gentlemen, I bring you the “Stone Cold Commander of the Century (Of the Week)”. Where does this come from? Yes, an Adult Swim video about football with Carl from Aqua Teen Hunger Force. Listen, I know I’m not the only one that loves MTG, and football, and Adult Swim (but I don’t like ATHF, don’t like the humor). And, I may be the one or two that love the “Charlie Whitehurst in a living nativity scene” joke, but we’re rolling with it. After all, I live in the Seattle area, and I still haven’t lived down the excitement of Lynch going full on “Beast Mode” to seal the game. Alright, enough Football talk. 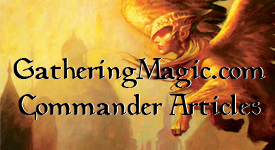 Yes, you’re getting a weekly column where I write some notes about a Commander chosen randomly from Magiccards.info. Yes, completely random (only I won’t repeat them if I’ve done them in this context before). Hope this will give you some good ideas for decks if you’ve been thinking about building around them. If you already have, make your comments below about what you’ve done with him/her. And yes, this is all completely random. You have seen who the Commander is in the title, but as of this I have no idea. Ready? 1R: Switch each creature’s power and toughness until end of turn. Good news, he’s kinda like a Red Doran. You know, without good colors backing him up. I kid, I kid, but it is a little harder to make the deck work. And yes, ever since the M10 rules change, you can’t do many tricks with this Commander. The Spirit creature type makes it uninteresting for long term value in Commander (thanks Kamigawa block!). At leas he(it? )s cheap, so we can get it out early. Let’s take a look at interesting Red creatures that have higher toughness than power. I mean sure, you can get firebreathing effects, but I think it’s time that our friend “Comprehensive Rules” pays a visit. What do you gotta say about switching Power/Toughness? 613.3e Layer 7e: Effects that switch a creature’s power and toughness are applied. Such effects take the value of power and apply it to the creature’s toughness, and take the value of toughness and apply it to the creature’s power. Example: A 1/3 creature is given +0/+1 by an effect. Then another effect switches the creature’s power and toughness. Its new power and toughness is 4/1. A new effect gives the creature +5/+0. Its “unswitched” power and toughness would be 6/4, so its actual power and toughness is 4/6. Example: A 1/3 creature is given +0/+1 by an effect. Then another effect switches the creature’s power and toughness. Its new power and toughness is 4/1. If the +0/+1 effect ends before the switch effect ends, the creature becomes 3/1. Basically, when you switch a creature’s P/T, all effects that would now change the power now changes the toughness, and vice versa. You want to Firebreathe? Won’t happen the way you want it to. However, equipment like Slagwurm Armor which gives the creature +0/+6 is just perfect. With Red being so aggressive, almost all of the P/T changes you can find are increasing the Power and lessening the Toughness. That makes sense when you want to attack; deal more damage to get it down quickly and you don’t mind “sacrificing” the creature to get it done. There are hardly any cards that increase toughness, making it difficult to do what the Commander wants to do. Obviously this won’t be a real powerhouse deck to mess with. But, you can have a little fun with it. Besides annoying your friends by packing in many P/T switching effects (About Face, Dwarven Thaumaturgist, and Strange Inversion) and confusing the board, maybe you can do something Red isn’t used to doing: playing defense. With the idea of the firebreathing creatures setting up as your “Walls”, it will allow you as the Red player to start picking off opponents one by one. Let’s do some discarding to do damage (Pyromancy, Jaya Ballard, Task Mage, Knollspine Invocation, Chandra Ablaze) all dealing damage to creatures or your opponents (with creatures, switching their P/T might be useful too). Using Mind’s Eye to gain card advantage and refueling your hand (as well as discarding Squee and other Phoenix creatures), it might be able to work. For this type of deck, you really have to play politics and not be afraid to win some people over. If you’ve wanted to try it, this will really be a good deck to work on that. Really, this is almost an empty cupboard from what I’ve done real quickly. Yes, you can use Dwarven Armorer in this deck, but is it even worth it? Again, this is going to be a “fun” type of Commander, where you’re not looking to win but cause havoc. Go ahead, be a little Griefer. There’s nothing wrong with having fun, but I believe in the long run, you’ll get crushed. Before then, you can have all the fun in the world. At least the art’s nice to look at. Right? You have any ideas, throw them down below. Seriously, this Commander’s a doozy. This entry was posted on Monday, January 10th, 2011 at 2:09 pm	and posted in Commander, EDH, Stone Cold Commander Of the Century (Of the Week). You can follow any responses to this entry through the RSS 2.0 feed. This is one of those decks you bring to a game and say” Guys, im just gonna sit here and durdle, ok?” and then have fun playing your commander and messing with the game. good job as always Robby, also, like what your doing on Manation also. I like the idea behind this article. Picking a random general to write about each week looks like it could lead to some really fun articles. Please keep it up. Y’know.. If the words ‘Spirit’ or ‘Arcane’ come up here ANYWHERE at all.. Feel free to NOT DO THEM. Earth servant seems like he would be pretty fun with manni. I really like the idea of this article. You did pick a somewhat difficult legend to build an EDH deck around for your first shot, though. I would first look for colorless effects that either pump toughness (usually undercosted relative to pumping power) or reduce power, to let your general kill off other creatures. After reviewing the commander, you should try giving a rating. I was a bit disappointed when I didn’t see a cute number on the bottom.